My Journey to Fit: FMM - Baby Shower! 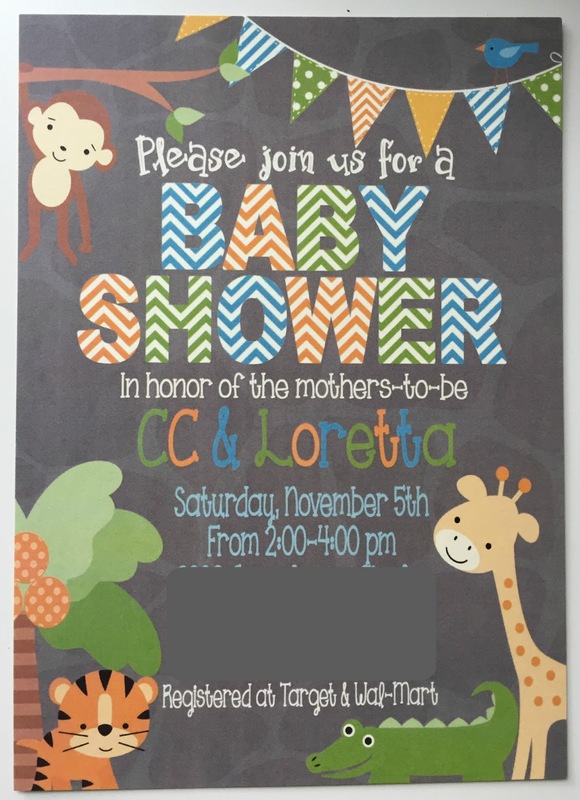 Last Saturday, we threw a baby shower for CC and Loretta, and I have to say, when the Renegades throw a shower, we throw a SHOWER! We all had our assignments and everyone came through with their items beautifully; I want to share some pictures with you because this was a group effort that turned out really well. Cary created the Mason name banner on her computer and printed it off - so cute! Karen painted and decorated the MASON jars, which she filled with fresh flowers. How perfect were these? Karen also made this adorable mobile, in Mason's room colors, and she even found a four-pack of jungle-animal buttons that she sewed onto some of the ribbon! I was in charge of corsages for the new mamas. I found an infant monkey rattle for one (I sewed on the toy pacifier and added the ribbon), and a lion pacifier keeper for the other. My practical side came out with these, but I liked getting them something that would be used by the baby later versus something that would be a dust collector. In case you're wondering - I bought these knowing that I'd have Andi to help hang them. A pineapple ducky, swimming in a sea of blueberries! This was just adorable. 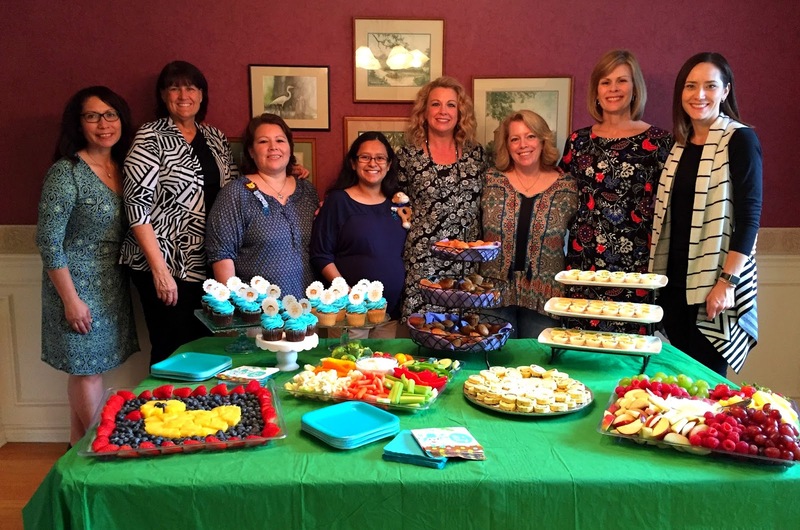 Left to right: Julia, Diane, Loretta, CC, Karen, me, Andi, Cary. The ties were glued to clothespins. I was off by a lot - my total cost for everything was $44.64, but the actual retail price was $81.96! What can I say, it's been a long time since I bought this stuff! Something for the baby to wear. These were from me; I'll have more details about the hat and sweater next week. Something for the baby to ride in - this was our group gift to them, a combination infant car seat and jogging stroller. Cary made the labels and Karen made the trail mix. Yummy and fun! We really enjoyed planning the shower - as it turns out, we Renegades are a creative group! Now we just need to wait for baby Mason to cook a while longer before we get to meet him - but at least he's been showered with lots of good things to make life easier for him and his mamas. You ladies are so creative! Thanks! We had fun coming up with everything. Have ya'll thought of starting Renegade Party Planners? (If you do I'll take $5 for the name suggestion lol). If not, you should, this was simply fantastic! Wow! What a lot of work and creativity all in one place! Your group is very generous and caring. Actually, there IS one bag of the trail mix in my cupboard! It was so good, and so cute with the animal cracker cookies mixed in throughout. That was a new one to me as well. Only problem was after the party, when we were dumping the drinks into the sink, the babies went into the garbage disposal! I had to fish them out before they gunked everything up. How adorable! You guys did a great job! CC and Loretta have great friends! What a great party! Is that a sock monkey hat? Eeeee! I love how you all came together on this - that is what makes parties like this a success - and shows the parents how loved they are!!! And, btw, your home is BEAUTIFUL! Wow, just wow. What a great baby shower you threw them. I have never spoken to anyone here in Holland who had such a great baby shower. Wonderful afternoon with your friends.